REGISTER NOW FOR NEXT WEEK'S EVENT! Confronting Health Inequity Event in Albany! NYAPRS Note: Don’t miss out on this important and stimulating one day event!There is still time to register for next week’s health inequities event in Albany! For racial and ethnic minorities in the United States, health disparities take on many forms, including higher rates of chronic disease and premature death compared to the rates among whites. To create a system where everyone gets what they need to be healthy, safe, and happy, we must be brave and confront the driving forces that deter us from having equitable outcomes for all. 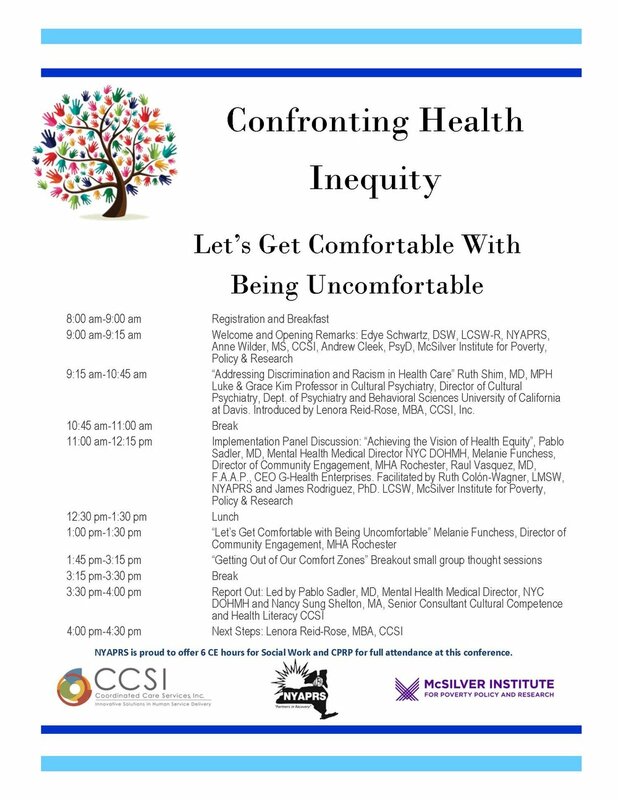 NYAPRS and our partners at the McSilver Institute and CCSI share a conviction to present this conference’s focus on the impact of racism on health and wellness. Participants will be asked to give themselves permission to indulge in the often uncomfortable experience of changing our minds!